On Ware It’s Made From Scratch’s Facebook page, I recently challenged followers to identify this fruit. Any ideas? 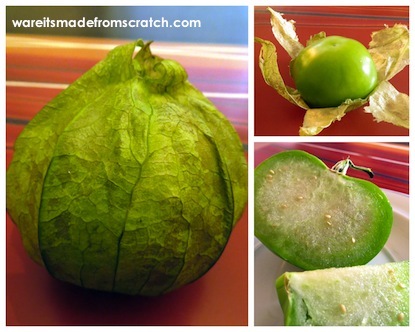 A couple of years ago, my husband grew miniature tomatillos. They were fun to pick, unwrap, and pop in our mouths. Recently, we came across these rather large ones at our local grocery store. 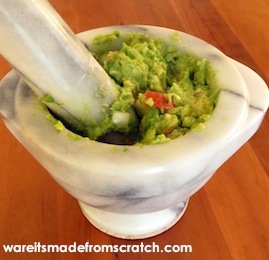 We decided to use it in our homemade guacamole while discussing how to get our miniature tomatillos to grow again! To make this guacamole, we mashed up two small avocados, chopped up a quarter of an onion, half a tomatillo, and a tomato. We squirted some lime over these ingredients and mixed them together. Yum!